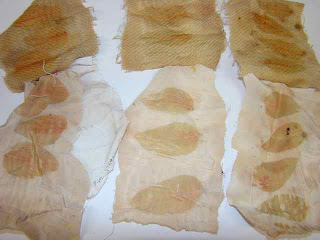 Over last weekend I pre-mordanted lots of little samples of cloth. pre-mordanting is when you soak fabric in a solution which (hopefully) will make the dye 'take' better. 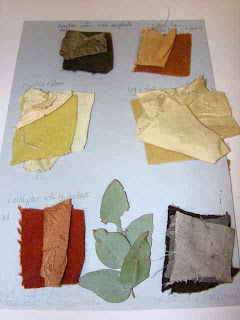 Plant dyes work better on protein fibres such as silk and wool and usually won't make much impact at all on cotton. if you pre-mordant cotton by soaking in soy milk you can sometimes make the plant dyes work on cotton. 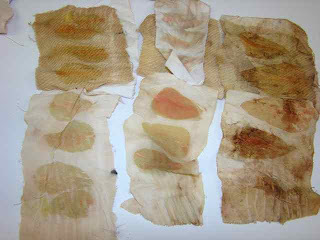 I pre-mordanted small samples of cotton, wool and silk in lots of different solutions to see which worked best. Each jar has a different solution in. I used milk, soymilk, diet coke, grapefruit, lemon, soda ash, salt, vinegar, egg, liquid starch, alum. The three fabrics were joined on one side and I used a laundry marker pen to label them. They were left in the solution for 3 days then dried and then rolled up with Eucalyptus leaves (from the tree in Duncan st near Tawa Station) and tied tight with string. Then I steamed them in a pot for 6 hours and left them overnight. The next day I opened them all out to see which of the pre-mordants gave the best 'Eco print'. I really didn't get much of a print on the cotton with any of the pre-mordants although soy milk at least allowed the cotton to pick up a print, even though it is nowhere near as strong as on the silk or wool. The bundle in the bottom picture on the right is the sample soaked in egg. It gave interesting prints on all the fabric samples but it stinks of egg as I think the egg protein has cooked into the fibres. I washed it but it feels very stiff. The clearest print on the silk is the centre bottom piece which shows all the leaf detail. It was soaked in Calci-trim milk. Soy milk also was a good pre-mordant for all the different types of fabric. In the depths of my memory I vaguely remember that you aren't supposed to use soda ash on protein fibres and I have discovered why! 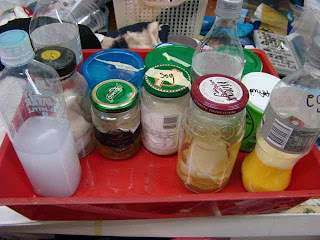 The wool sample that had been soaked in soda ash started to turn to jelly. Deb says the fibres were becoming 'denatured', it felt really gross and sticky although it doesn't feel as bad now it has dried. Here is a sample page, not very scientific but pretty. Top right - lichen from my apple tree with alum for a mordant. A nice orange colour. Bottom left - eucalytus no mordant. Middle - the leaves of the eucalytus used to get the red. Bottom right - pohutukawa with chunk of rusty iron for the mordant. Very black colour on wool.